This fast-growing, semi-evergreen perennial grows to between 1 and 4' tall and spreads by creeping rhizomes to form a dense colony about 2-3' wide. Spikes of golden-yellow flowers bloom in summer and early fall. California goldenrod is a widespread perennial found in many plant communities throughout California, Baja California, Oregon, the Modoc Plateau, the White and Inyo Mountains. It grows in both dry and moist sites in clearings and woodland margins below 7,000 feet. 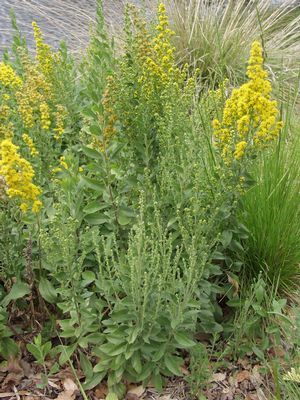 California goldenrod is a fast-growing, vigorous plant that spreads by creeping rhizomes (underground stems). It produces dense colonies of upright wand-like stems that can grow to between 1 and 4 feet tall. These stems are clothed in gray-green lanceolate leaves. Until goldenrod starts blooming, it looks fairly unspectacular. However, once in bloom it puts on a spectacular show from summer through fall. The tall stems are tipped with masses of golden yellow flowers arranged in cylindrical or slightly pyramid-shaped spikes. These flowers are a nectar heaven for myriad bees, butterflies and other insects. They also make a good cut flower. For the best display of flowers, plant goldenrod in a really sunny spot and give it occasional water in the summer. It's tolerant of some light shade and can be planted under oaks. However, you won't get such a great floral display in the shade. Assuming there's been a relatively normal winter rainfall, California goldenrod will survive without any summer water once it's established. In hotter inland areas, however, it will definitely put on a showier and longer flora display if you give it an occasional deep watering. As mentioned above, limiting the amount of summer water you give goldenrod also helps to control its vigorous growth rate. Remember that infrequent deep waterings encourage plant roots to travel deeper in search of water. This helps make them more drought tolerant. Frequent shallow watering just encourages roots to stay in the top few inches of soil and plants will be much less able to survive periods of drought. 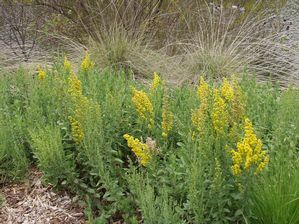 Goldenrod is well suited to large meadows or grouped plantings of larger grasses such as California fescue (Festuca californica) and deer grass (Muhlenbergia rigens). It combines particularly well in these situations with Pacific aster (Symphotrichon chilense - formerly Aster chilensis) and some of the taller selections of california fuchsia (Epilobium / Zauschneria species) where the three can bring some valuable late season color to the native garden. The spreading nature of goldenrod's rootstock can help prevent surface soil erosion which makes it a useful plant for banks and slopes. Be careful when planting golderod in small gardens as it can be invasive, especially if it's planted in moist soil. Goldenrod's a wonderful source of pollen and nectar for pollinators and beneficial insects (see below). This, coupled with its late blooming season, makes it a good addition to a beneficial insect hedgerow. 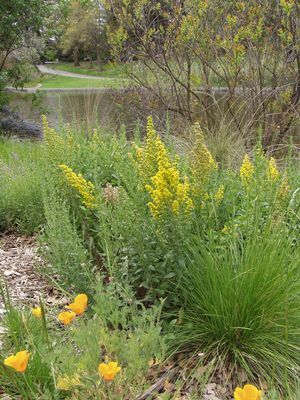 California goldenrod is an excellent source of both pollen and nectar for native bees, honey bees and parasitoid and predatory beneficial insects. It's also a good nectar source for butterflies. Butterflies seen feeding on goldenrod include the monarch, Northern checkerspot and Columbian skipper (source calfora.org). After flowering has finished, cut back the dying flower stems and drying foliage to the ground.